Adobe Live 2007 kicks off in London today, attracting the cream of the digital creative arts world to the two-day art and design conference. 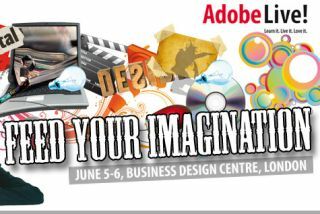 The annual free event is the high-point of the digital arts calendar, with the UK's illustrators, graphic designers, photographers and motion graphics artists descending on Islington's Business Design Centre for all things Adobe-related. Expect the Adobe Live 2007 program to be heavily centred on the recently released Creative Suite 3 packages - which included updates to Illustrator, Photoshop, InDesign and, for the first time since Adobe acquired Macromedia, Flash and Dreamweaver. Adobe Live 2007 also incorporates exhibition stands, workshops and seminars over the two-days. Guest speakers including creative super star Neville Brody, filmmaker and design expert Hillman Curtis, and Flash-guru Brendan Dawes, as well as a session from our sister magazine Computer Arts . "The UK creative industry is recognised throughout the world as a pioneer, always pushing the boundaries on what can be achieved," said Mark Wheeler, Adobe's European Marketing Director. "With Adobe Live we hope to help foster this creative energy and inspiration by bringing together leading visionaries across all areas of the industry". Over 150 presentations and seminars are schedulled over the Adobe Live 2007 confrence, with specific sessions time-tabled for all of Adobe's recently released Creative Suite 3 products as well as showcases of some of Adobe's latest technologies. For the first time this year Adobe Live is running a concurrent developers day at the event, and it's widely expected that the Flex 3 and Apollo technologies will be heavily demoed at the show, flaunting what Adobe has described as its next-generation of Rich Internet Applications (RIAs). So far Adobe has released the basis of its Spry internet applications within Creative Suite 3, with support from Flash CS3 and Dreamweaver CS3 in particular. Flex and Apollo build on this framework to deliver both on and off-line RIAs directly accessible from a users desktop - something Adobe has been touting for some time now. Also in attendence is Apple who - together with Adobe - has forged deep links with the creative design community. While Apple may have released Final Cut Studio 2 - it's high-end video editing suite - we don't expect them to be pushing it heavily. Adobe has recently announced its own upgrade to its video-editing arsenal via the Production Premium version of Creative Suite 3 - complete with new versions of Premiere, After Effects and its first sound editor Soundbooth. According to Adobe, the main aim of the conference is to focus in on the key areas of the UK's creative industries; design, publishing, photography, web and video work - all of which Adobe has something of a monopoly on since its buy out of Macromedia. Microsoft, however, has something of a spoiler on the hortizon in the shape of Silverlight , its own recently demoed RIA format. We certainly don't expect much discussion of it at Adobe Live, but with Silverlight hyped as a potential Flash-killer in the RIA stakes, developers and designers in attandence are certain to pose some tricky questions to Adobe.